Ready to get your "Game On"? Game On! 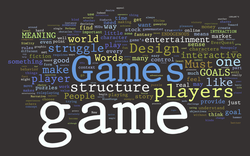 is a weekly activity hosted by students, designed to explore gaming and its ability to improve learning through strategy, and collaborative challenges. Pairs will research, present, and guide students through a chosen game, providing opportunities to explore subjects from all different areas. The game that you have selected is your choice, however, it must be teacher approved one week prior to delivery and must not match another pair's game. Each week, a different pair will host their game. ​Think outside the box and find a really cool and fun game. The more fun and interesting the game, the better you'll do. Find the educational element to your game. Whether it be in the strategy, the content, or the collaborative nature of its design. ​Engage the students, don't put them to sleep with your website and presentation. ​Don't talk in a monotone voice throughout the entire presentation. Have a fun and excited voice, it really helps!